Selecting a well-qualified water restoration contractor to restore your property will yield short and long-term dividends. Our process for tackling a water damage loss begins with a detailed assessment of the property using our knowledge of building construction standards and materials. Following assessment of damage, we use a detailed and methodical system for documenting all damage to the structure and contents of a property in order to ensure a thorough recovery for our clients. We are an OSHA complaint company that exercises prudence and worksite awareness. Using safe work practices protects our workers and the interest of our clients. Applying controls to ensure worksite safety increases overall productivity. Due to the level of expertise required to properly dry structure, educated professionals should always be selected to handle any water restoration. Whatever the source of the water damage, the impact on the ecology within the affected structure is important for healthy indoor conditions. Biological growth is always a great concern in the water restoration industry. Wet structure paired with favorable temperatures for microorganisms can initiate microbial amplification. The importance of a timely response to any water damage is necessary to prevent secondary damage, to stop the amplification of microorganisms, and to minimize potential health effects. What is the advantage of selecting Clean Pro as a water restoration contractor? Simply, we are willing to go the extra mile for our clients. We value our clients and understand the stress that can result from water damage. The following information is submitted by the Institute of Inspection, Cleaning and Restoration Certification (IICRC) as a public service to those who have suffered water-related losses due to storm damage (e.g., hurricane, tornado). Since there are many variables involved in deciding about appropriate restoration steps, users of this information assume any and all liability for implementing the procedures covered herein. The following recommendations assume water-related storm damage to residential or light commercial structures. For recommendations regarding restoration of major commercial properties and building assembles, it is important to consult with professionals who have specific training and experience in this area. Whether insured or not, it is important for property owners to document damage with photographs or video, and immediately, to begin loss mitigation procedures themselves; or hire a qualified contractor to do this on their behalf. It is totally inappropriate to put off mitigation while waiting for an insurance claims representation to arrive on the scene to evaluate the loss. By that time, in all probability sufficient time will have passed to grow and amplify microorganisms, which may not be covered by insurance. Loss mitigation is defined by insurance policies as “reasonable and prudent measures designed to preserve, protect and secure property from further damage,” including microbial growth and amplification. Category 1 Water: That which is clean as the releasing source and does not pose a hazard if consumed by humans. Category 1 water may become progressively contaminated as it mixes with soils on or within floor coverings or building assemblies (walls, decking, sub-flooring). Time and temperature, which promote the growth and amplification of microorganisms in water can cause Category 1 water to degrade. Examples: burst water pipes, failed supply lines on appliances, vertically falling rainwater. Category 2 Water: That which begins with some degree of contamination and could cause sickness or discomfort if consumed by humans. As with Category 1 water, time and temperature can cause Category 2 water to become progressively more contaminated. - The first involves falling or windblown rainwater that enters as a result of damage to roof components or wall assemblies. - The second involves horizontally traveling ground surface water (Category 3) containing silt and soil contaminants that infiltrate into structures, generally through doors or around foundation walls. This ground surface water (storm surge) may accumulate to a depth of several inches or several feet When structures are partially submerged or remain substantially flooded for weeks, far more elaborate procedures usually are required. Structural Integrity – Before entering a storm or flood-damaged structure, consider structural integrity, which may be impacted by the force of the wind on, or the force of the water entering the structure. When in doubt, obtain an evaluation by a licensed and qualified builder or structural engineer before entering. Ventilation – Fresh moving air discourages the growth and amplification of microorganisms. Open windows and doors and air the structure out thoroughly. It is highly recommended that ventilation be maintained during and following the restoration effort, or until damp areas can be contained and subjected to mechanical dehumidification (HVAC or specialized equipment). This reduced, but does not eliminate, inhalation of microorganisms. Shock Hazards – Ensure that electrical shock hazards have been eliminated by turning off the supply of electricity (circuit breakers) to damaged areas. Anticipate that electricity may be restored suddenly without notice. Personal Protective Equipment – Wear protective clothing, boots with steel or fiberglass shanks, and a hard hat. Protect yourself from injury or exposure to microorganisms. Wear protective gloves before handling contaminated materials. Splash goggles are highly recommended to protect and prevent microorganism entry through the eyes. An organic vapor respirator (paint respirator) is highly recommended to prevent inhalation of most microorganisms or spores. Remove quantities of debris (silt, vegetation, floating objects brought in by the storm surge), if present, with shovels, rakes, etc. Carefully clean all tools with appropriate detergents after use. - When wind-blown rain enters a building, it is important to identify the route of entry and to trace its path, as possible, to identify all wet components ( ceilings, walls, insulation, framing). Professional water restoration contractors, when available, have specialized water-detection equipment and may be available to assist in this determination. - In rising water situations, typically there will be visible water line on drywall or paneling. However, water may migrate or wick upward within the all material insulation behind the wall. When wetting is caused by storm damage and comes from overhead or around opening in the building envelope, and especially when power has been interrupted in hot climates, it is important to remove wet components, as possible, to expose pockets of saturation to air circulation before microbial growth can occur. - Begin at the point of water entry and trace the path of wetting, removing ceiling and wall components and insulation as you go. - Although it may be possible for professional with specialized equipment to dry carpet, pad and sub-flooring materials, when damage is wholesale in an area, seldom will qualified contractors be available to respond for this work. Therefore, it is normally prudent to remove all saturated carpet and pad. - It is highly recommended that solid or laminated wood flooring, or sheet vinyl be removed to expose pockets of saturation. - Remove and dispose of drywall (Sheetrock), paneling or other wall materials up to a point 15*24 inches above the water line visible on the wall. If possible, stay within four feet of the floor to salvage as much wall material as possible, since drywall is usually installed horizontally in 4’x8′ or 4’x12′ panels. - Remove and dispose of wet insulation materials exposed during wall removal. Look for evidence of moisture wicking up insulation materials. Leave only wall framing components that are durable and minimally porous, and which can be cleaned and decontaminated with relative ease. - Remove and dispose of floor coverings; carpet cushion, pad, felt and sheet vinyl, laminate, or tile flooring materials. Porous materials may absorb considerable quantities of water and contaminate, and non-porous materials may trap moisture to prolong drying. The inevitable results will be rapid microorganism growth, along with associated odor and health hazards. Hardwood flooring should be removed since contaminates and moisture will collect underneath in the flutes or hollow areas between the hardwood and the subfloor. With Category 1 (clean source) water (e.g., rainwater), drying is the next course of action required to prevent on-going damage due to microbial development. The following procedures may require the assistance of a professional water damage restoration company. If available, which has trained technicians, specialized cleaners, biocides, extraction, drying and dehumidifying equipment, and moisture measuring and monitoring instruments. A certified professional can be located by calling the profit IICRC toll free at 800 835-4624 or by accessing www.certifiedcleaners.org. When approached by any company for water restoration services, ask to see the technicians’s official IICRC wallet card that attests to his or her training and certification, or call IICRC’s toll-free number for verification. - Since many biocides are inactivated by quantities of organic contaminants, cleaning always should precede biocide application. - When fresh water is restored within the structure, mix an appropriate general-purpose household cleaner according to the label directions and liberally spray it onto salvable components. - Brush agitation may be required to evenly distribute cleaning solutions, followed by at least ten minutes of “dwell time” for soil suspension. - Where appropriate, flush contaminants from salvageable surfaces with a water hose or pressure washer. Work from top-to-bottom and from walls-to-flooring. - Wet vacuum or mop up excess rinse water from flooring materials immediately. Be sure to thoroughly flush all contaminants from wall frame (sill plate) areas. Pressure washing, if available, is specifically recommended to flush contaminants from hard-to-access areas, followed by removal of contaminated water from industrial wet vacuuming equipment. - Repeat steps as necessary, until all surfaces are clean and contamination is physically removed. - Applying disinfectants or biocides usually is unnecessary with Category 1 (clean source) water, since this may only serve to introduce additional moisture into the building, which may prolong drying. - With Category 2 or 3 water contamination, while maintaining ventilation and skin and respiratory protection, liberally spray cleaned salvageable materials (studs, decking, joints, etc.) with an appropriate biocide. A 6% solution of household chlorine bleach (e.g. Clorox) mixed 1 part bleach to 11 parts water may be used on durable, colorfast surfaces. Never mix chlorine bleach with ammonia or strong acids. An appropriate alternative to chlorine bleach may be a 3% solution of hydrogen peroxide. - In rising water situations, following application of properly diluted biocides, brush agitate all areas to encourage biocide distribution and penetration into cracks and crevices. Dry structural components with plenty of air circulation, while maintaining constant ventilation (weather conditions permitting). If possible, take advantage of low outside humidity (check local weather reports). Use oscillating or box fans, repositioning them with the structure every few hours. Avoid temperature extremes that might slow drying, or promote microorganism growth (around 72-75°F.22-25°C is ideal). Rent high-volume professional drying equipment (air-movers and dehumidifiers) if available, especially in areas where ventilation is not possible (sealed buildings, security problems). It is highly recommended that electrical components that were wet be checked for operational safety by a qualified contractor. - Leave cleaned structure surfaces exposed to fresh air movement for several days or even weeks, or until you are sure that they have returned to within four percentage points of normal moisture content (MC) levels (generally the normal MC of structure wood is around 10%). Otherwise, subsequent structural damage and/or health effects may result after wall and flooring materials have been replaced or painted. 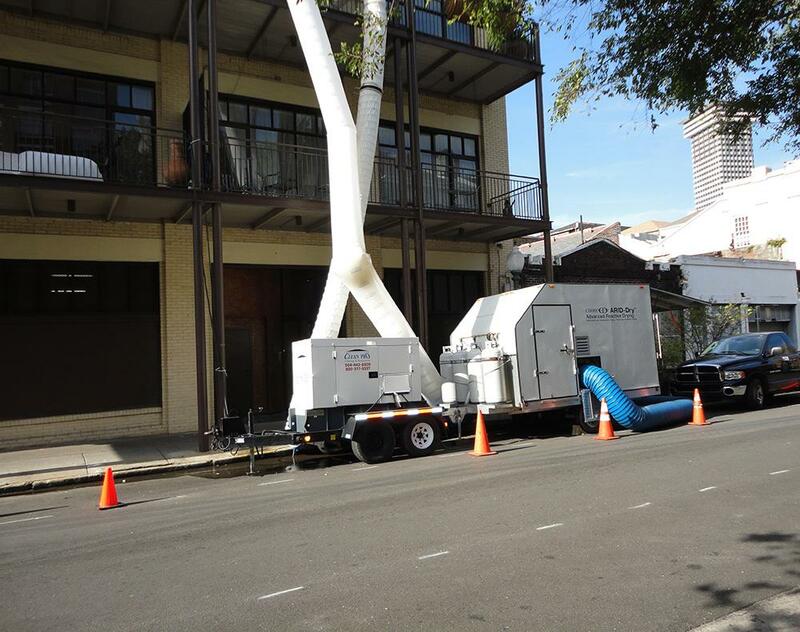 Professional water restoration contractors with specialized, high-capacity drying equipment can shorten drying times considerably. - Reconstruct or replace components as required. Where financial resources permit, it is highly recommended that comprehensive restoration be accomplished by trained, Institute of Inspection, Cleaning and Restoration Certified (IICRC) Water Damage Restoration Technicians. They may be located by calling IICRC referral line at 800 835-4624 (www.iicrc.org). Consider hiring a professional restorer to evaluate moisture levels in structural materials before reconstruction.